The Cruel Hand of Intolerance. D.W. Griffith’s masterpiece encompasses four stories (the modern era, Jerusalem, 1572 Paris, and Babylon), tackling both time and geography. Boasting a cast of thousands, gargantuan sets, chariot races, the crucifixion, death defying stunts, and the fall of Babylon, Intolerance truly gives meaning to the words, "epic cinema." There can be no complete collection of silent cinema without this celluloid masterpiece. When the AFI released their first list of the 100 Greatest American Films in 1997, DW Griffith made the chart with 1915’s Birth of a Nation. While Griffith still earned one slot on the AFI’s updated 10th anniversary list in 2007, the selected film changed. Birth dropped off the chart entirely, and in its place, we found Griffith’s follow-up: 1916’s Intolerance. This alteration seems ironic given the title of the new selection and the fact that Birth’s disappearance may reflect some intolerance of its own. After all, Birth often acts as a love letter to the Ku Klux Klan, so no matter how innovative and influential it may have been as a film, it will always inflame passions against it. Does this mean that Intolerance shows up on the new AFI list in an attempt to display greater political correctness? Perhaps, or maybe the voters just think it presents a better film. In any case, it stands as the oldest movie on the AFI 100 list, and one of only a few silent offerings. Subtitled “Love’s Struggles Throughout the Ages”, Intolerance splits into four eras with four different – though related – tales. We get “Modern Day”, “Paris” (1572 AD), “Jerusalem” (circa the time of Christ) and “Babylon” (539 BC). As declared by an early title card, “Each story shows how hatred and intolerance through all the ages have battled against love and charity”. This means we jump from one tale to another throughout the film. “Modern Day” and “Babylon” easily dominate the proceedings. In “Modern Day”, we see how “reformers” cause havoc in the life of a young couple, while “Babylon” looks on the battles among the powers of that age. “Jerusalem” offers little more than Jesus’s Greatest Hits, really; it’s the least prominent of the four. “Paris” looks at the excesses of that era’s ruling class and the problems they caused. It gets a lot more play than “Jerusalem” but not nearly as much as the other two. It’s easy to see Intolerance as something of an apology for the racist excesses of Birth. 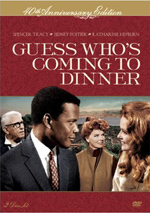 The theme that links all four stories comes from the film’s disdain for those who deem themselves superior to others and judge the actions and attitudes of others. The flick also depicts all the problems that stem from negative trends like envy, lust and – you guessed it – intolerance. Was this Griffith’s attempt to tell his critics to back off? The film sure comes across that way, as never have I seen an epic so devoted to emotion over story. In terms of narrative, “Modern Day” easily offers the most coherent tale. Honestly, it’s the only one that makes real sense, as we can easily follow its plot and characters. Actually, “Jerusalem” is simple to handle as well, but it’s such a minor part of Intolerance that it almost doesn’t count. Both “Babylon” and “Paris” can become rather convoluted. On the other hand, those two provide the movie’s most epic scenes, “Babylon” proves particularly extravagant. With its enormous, lavish sets and scores of extras, that part of Intolerance offers grand filmmaking on a shockingly epic scale. I expect this kind of grandness from something made 40 years later; to see it in a flick from the early days of cinema truly surprises me. I wish the “Babylon” story made more sense, but the production values are incredible. As is the full scope of Intolerance. Again, it’s easy to forget just how new movies were back in 1916. The form remained pretty primitive and basic, but Griffith made a true epic in which he deftly interwove four different stories. No, I can’t say that all of them succeed, but the ambition on screen here dazzles. A flick like this would still be daring today, but in such an old picture, the scale really knocks me for a loop. I can’t say it’s the most entertaining movie I’ve seen, but as a piece of cinema history, Intolerance is a fascinating document. Intolerance appears in an aspect ratio of 1.33:1 on this Blu-ray Disc. I felt impressed by this time-defying transfer. Not that one should expect Intolerance to look like a modern movie, of course, as it still showed marks of its era. However, the Blu-ray gave us a very positive presentation for a movie that will soon celebrate its 100th birthday. Sharpness worked well. At times the elements could be a little on the soft side – especially in some wide shots – but those instances remained unremarkable and caused no real distractions. While it lacked the precision we’d get with a modern movie, definition seemed solid. I noticed no issues with jagged edges or shimmering, and edge haloes were absent. With healthy grain, I didn’t suspect any excessive digital noise reduction, and print flaws failed to create real concerns. Occasional instances of small scratches and other marks could be observed, but these were far, far below the levels one would anticipate in a movie from 1916 and were barely noticeable from a normal viewing distance. If you like to watch your set from a foot away, you’ll see them, but otherwise, you’ll likely not detect them much of the time. 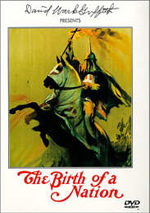 Ala Birth of a Nation, Intolerance often used tints for its various scenes. These usually stayed with pretty neutral colors but occasionally went for reds, purples or greens. No one will accuse the hues of vivacity, but they were clear and well-rendered given their origins. Blacks also seemed pretty dark, and low-light shots showed nice smoothness. I find it tough to imagine that Intolerance will ever look better than it did in this excellent transfer. In terms of audio, the film came with a DTS-HD MA 5.1 score written by Carl Davis. It presented a perfectly serviceable accompaniment to the film. Stereo imaging was fine; at times the music seemed a little too centered, but it usually spread across the front in a pleasing manner. The “5.1” nature of the mix didn’t do much, however. Any use of the back speakers remained insignificant, as the track focused heavily on the front channels. That was fine, as the material didn’t need to blast from all five channels. The music came across as full and vivid as well. The score worked fine for the movie. How did the Blu-ray compare to the DVD from 2003? The new disc showed tremendous improvements. The DVD was a disaster, with messy, ugly visuals as well as poorly-reproduced audio taken from scratchy vinyl records. The Blu—ray crushed the DVD in every possible way. While the prior DVD included zero extras, we get a decent mix of materials here. On Disc Two, the main attraction comes from two additional silent films directed by DW Griffith. We get 1919’s The Mother and the Law (1:39:32) as well as 1919’s The Fall of Babylon (1:02:34). As you watch these movies, you may experience a strong sense of déjà vu. Why? 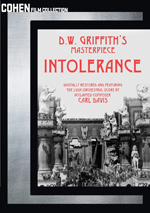 Because they simply offer re-edited versions of Intolerance; Law concentrates on the 1916 film’s “modern” story while Fall delivers the Babylonian elements. This means Law and Fall exist as historical curiosities and nothing more. Perhaps some may enjoy the reworking of the tales, but I think they seem pretty pointless. As presented here, the movies also look much, much worse than the feature on Disc One. As archival elements, it’s cool to get Law and Fall, but I can’t imagine many will care to watch them more than once. In addition to a 2013 Restoration Trailer, Disc Two includes a featurette called Three Hours That Shook the World. It runs 19 minutes, two seconds and provides notes from film scholar Kevin Brownow as he discusses DW Griffith’s career, the creation of Intolerance and its aftermath. I’m disappointed the Blu-ray lacks a commentary, but Brownlow manages an efficient and informative set of notes. Disc One opens with ads for The Attack, Hail Mary, For Ever Mozart, The Prey and “The Vivian Leigh Anniversary Collection”. Finally, the package includes a booklet. In this 16-page piece, we get essays from film historian William M. Drew and Cineaste editor Richard Porton along with credits and stills from the movie. The booklet complements the set well. As a movie, Intolerance provides an absorbing piece of history. It doesn’t always succeed as storytelling, but it’s so grand and intricate that it keeps us interested. The Blu-ray boasts terrific picture quality along with good audio and a decent array of bonus materials. This becomes a stunning version of a classic film.